The amazing journey of Philae, imaged by Rosetta’s OSIRIS camera. Before going into hibernation at 01:36 CET on 15 November 2014, the Philae lander was able to conduct some work using power supplied by its primary battery. With its 10 instruments, the mini laboratory sniffed the atmosphere, drilled, hammered and studied Comet 67P/ Churyumov-Gerasimenko while over 500 million kilometres from Earth. After a triple landing, positioning it in a new, unplanned location, conditions were not optimal, but Philae was able to work for more than 60 hours and send the resulting data back to Earth. It was controlled and monitored from the German Aerospace Center (Deutsches Zentrum für Luft- und Raumfahrt; DLR) Lander Control Center (LCC). Now, the complicated data analysis begins. DLR's Scientific Director for the project, Ekkehard Kührt, is very pleased with the results so far. "We have collected a great deal of valuable data, which could only have been acquired through direct contact with the comet. Together with the measurements performed by the Rosetta orbiter, we are well on our way to achieving a greater understanding of comets. Their surface properties appear to be quite different than was previously thought." The team responsible for the MUPUS (Multi-Purpose Sensors for Surface and Sub-Surface Science) instrument, which hammered a probe into the comet, estimates that Comet 67P is hard as ice: "Although the power of the hammer was gradually increased, we were not able to go deep into the surface," explains Tilman Spohn from the DLR Institute of Planetary Research, who is leading the research team. Shortly after the triple landing, the scientists could only hope that Philae would be in a position that would allow the probe to be hammered into the surface. However, with MUPUS it has been possible to directly study the strength of a comet's surface for the first time – and 67P/Churyumov-Gerasimenko proved to be a 'tough nut to crack'. "We have acquired a wealth of data, which we must now analyse," says comet researcher Spohn. Only the thermal sensors and accelerometers in the anchors that should have fixed Philae to the comet’s surface were not used, because they were not deployed during the touchdown. The team of the SESAME experiment (Surface Electrical, Seismic and Acoustic Monitoring Experiment) can confirm that Churyumov-Gerasimenko is not nearly as soft and fluffy as it was believed to be. "The strength of the ice found under a layer of dust on the first landing site is surprisingly high," says Klaus Seidensticker from the DLR Institute of Planetary Research. 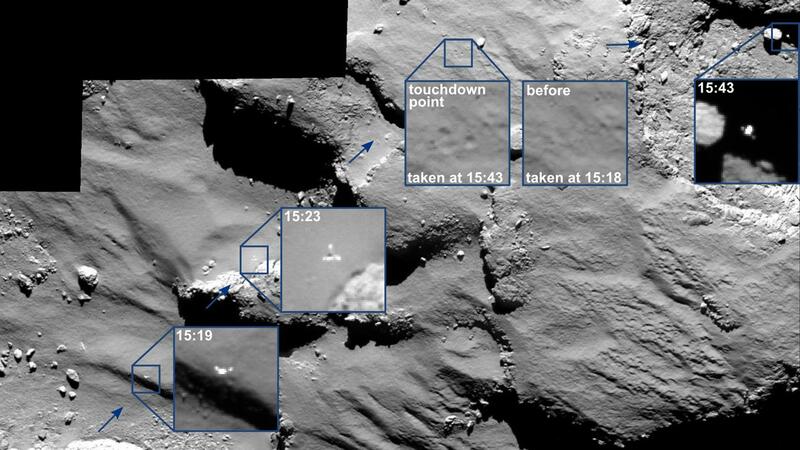 The instrument CASSE, which sits in the feet of the lander, was turned on during the descent and clearly registered the first landing as Philae came into contact with the comet. From additional data, the mechanical properties of Churyumov-Gerasimenko will be derived. SESAME's two other instruments suggest that cometary activity at this landing site is low, as well as revealing the presence of a large amount of water ice under the lander. The last of the 10 instruments on board the Philae lander to be activated was the Sampling, Drilling and Distribution (SD2) subsystem, which was designed to provide soil samples for the COSAC and PTOLEMY instruments. It is certain that the drill was activated, as were all the steps to transport the sample to the appropriate oven. COSAC also worked as planned. Now scientists need to analyse the data to determine whether a soil sample was actually examined in the gas chromatograph. This will be done in collaboration with several instrument teams. Did CASSE hear drilling? What soil strength did MUPUS encounter when hammering? With what force was the SD2 drill used? "We currently have no information on the quantity and weight of the soil sample," says Fred Goesmann from the Max Planck Institute for Solar System Research. However, COSAC was able to 'sniff' the atmosphere and detect the first organic molecules after landing. Analysis of the spectra and the identification of the molecules are continuing. One of the big 'winners' of the Philae landing is Stefano Mottola from the DLR Institute of Planetary Research, who is responsible for the ROLIS (ROsetta Lander Imaging System) camera. The instrument, mounted on the bottom of the lander, acquired images during the first descent showing the planned landing site, Agilkia. Even after the third landing, it proved possible to reactivate ROLIS and acquire images of the comet’s surface at close range. Thus, the team has data for two different locations on the comet. A wealth of data was also obtained with the CONSERT (COmet Nucleus Sounding Experiment by Radio wave Transmission) instrument. To achieve this, the lander and orbiter were on different sides of the comet and worked together to analyse the comet nucleus by passing radio signals through it and creating a three-dimensional profile of the core. During the CONSERT measurements, Philae went into hibernation after the power from its primary battery was exhausted. This battery was flown through space already charged to ensure the completion of the first scientific work phase. "I'm very confident that Philae will resume contact with us and that we will be able to operate the instruments again," says DLR Lander Project Manager Stephan Ulamec. Once the rechargeable secondary battery has been warmed by sunlight again, Philae will restart and the DLR LCC team will take their places at the control consoles again. "At the first landing site, we would, of course, have had better solar illumination conditions," says Ulamec. "Now we are somewhat in shadow, we will need more time to charge." One advantage of the shadier landing site in a crater is that the Philae lander will not overheat as quickly as the comet approaches the Sun, but will benefit from the stronger sunlight. The team managed to rotate the lander during the night of 14/15 November 2014, so that the largest solar panel is now aligned towards the Sun. Stephan Ulamec believes it is probable that in the spring of 2015, the DLR LCC will once again communicate with Philae and receive data about how the lander is faring on Comet 67P/Churyumov-Gerasimenko. In the summer of 2015, it might be possible that temperatures on the comet will allow Philae’s battery to be recharged. "The orbiter will continue with its overflights to receive any signals from the lander once Philae wakes up from hibernation." Rosetta is an ESA mission with contributions from its member states and NASA. Rosetta's Philae lander is funded by a consortium headed by DLR, the Max Planck Institute for Solar System Research (MPS), CNES and the Italian Space Agency (ASI).